Pocket hematoma formation is a common complication after pacemaker and implantable cardioverter‐defibriIlater (ICD) placement. In this study, we investigated the influence of patients' comorbidities on the rate of pocket hematoma formation after pacemaker and ICD placement. This study retrospectively evaluated a cohort of 458 patients (male 65%, mean age 71 years) who underwent pacemaker and ICD placement at Regions Hospital in St. Paul, Minnesota, from January 2004 to August 2008. Fifty‐seven percent of patients were on warfarin, 27% on intravenous heparin or subcutaneous enoxaparin, and 66% were on antiplatelet therapy at the time of device implantation. 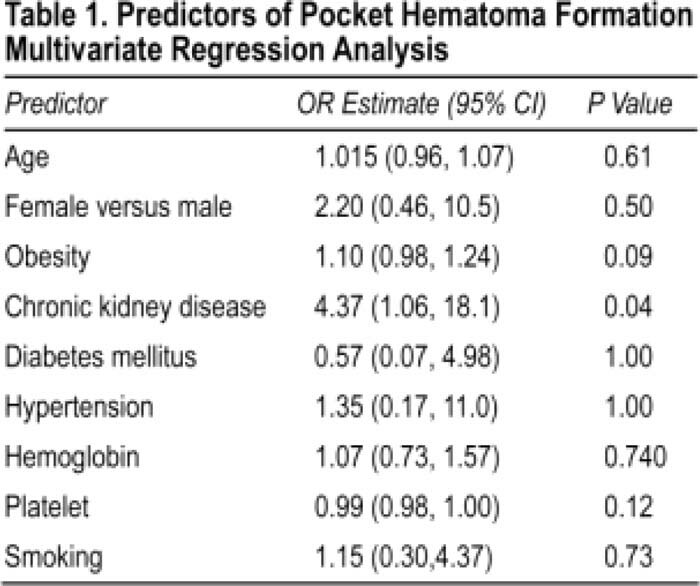 Predictors of pocket hematoma formation were analyzed by multivariate regression analysis. A P ≤ 0.05 was considered significant. The incidence of pocket hematoma was 2.2%. In multivariate regression analysis, after adjusting for anticoagulation and antiplatelet agents, chronic kidney disease was found to be a significant risk factor of pocket hematoma formation after ICD and pacemaker placement. An increase of 1.0 mg/dL in creatinine level was associated with a higher rate of hematoma formation (OR 1.99, 95% Cl 1.22–3,21, P = 0.03), Table 1 shows multivariate regression analysis of various variables. Chronic kidney disease was found to be a significant risk factor for pocket hematoma formation after pacemaker and ICD placement independent of anticoagulation and antiplatelet agents. I. Ahmed, none; W. Nelson, none; C. House, none; R. Dahiya, none; D. Zhu, none. Ahmed I, Nelson W, House C, Dahiya R, Zhu D. Chronic Kidney Disease Is a Significant Risk Factor of Pocket Hematoma Formation after Pacemaker and Implantable Cardioverter‐Defibrillator Placement Independent of Anticoagulation and Antiplatelet Agents. Abstract published at Hospital Medicine 2010, April 8-11, Washington, D.C. Abstract 5. Journal of Hospital Medicine. 2010; 5 (suppl 1). https://www.shmabstracts.com/abstract/chronic-kidney-disease-is-a-significant-risk-factor-of-pocket-hematoma-formation-after-pacemaker-and-implantable-cardioverterdefibrillator-placement-independent-of-anticoagulation-and-antipla/. Accessed April 25, 2019.